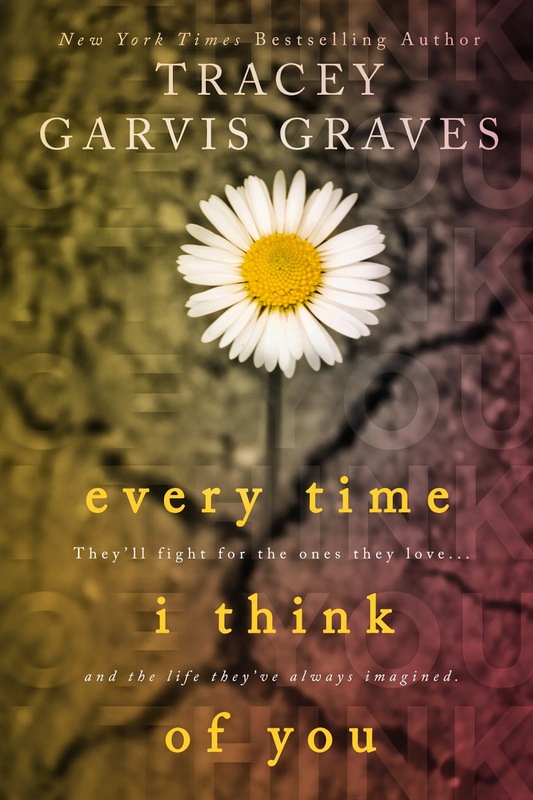 We are so excited to share the cover for the upcoming Every Time I Think of You, by New York Times Bestselling author Tracey Garvis-Graves. We also have the first chapter available for you to read! Three-year-old Elliott DiStefano hid underneath his mother’s bed when the shouting started. He didn’t understand what the raised voices coming from the living room meant, but instinct told him to hide. No one ever yelled in his house. Sometimes they used a different tone with him, firmer. “Stop climbing everything, you little monkey,” his mama would say or, “It’s time to pick up your toys and get ready for bed,” Nana would announce. Most of the time he would do what they said, although sometimes they had to ask him twice, especially if what he’d rather do was play a little longer. But they never spoke to him in such a harsh way, and they never told him to shut up like the man in the living room just did to Nana. Elliott clutched his favorite green army man tightly in his hand. His nana had given him a bath after their early dinner at five, and asked if he was ready to put on his pajamas. “I can do it myself,” he’d told her, and she’d smiled and walked out of the bedroom he shared with Mama, closing the door behind her. She’d promised they could watch a movie and that Elliott could have one of the cookies they’d baked earlier that day for his bedtime snack. But then someone knocked on the door and now there was yelling and no movie and no cookie. The man’s voice was scary and mean. Nana sounded like she was crying and as Elliott’s fear grew he began to tremble. The yelling got a little louder, followed by a crash and a thud. Then nothing. Was the bad man still there? What if he’d left but planned to come back? Elliott could no longer hear Nana’s voice and he wondered where she went. Did she leave? Did she go with the man? He curled himself into a tight ball and began to cry silent tears. He had no way of knowing how much time had passed. It was dark under the bed and the crying had tired him out, so he rubbed his stinging eyes and took a little nap. When he woke up he desperately needed to go to the bathroom. His mama and Nana had been so proud of him when he stopped wearing diapers, and he hardly ever had accidents, but he couldn’t risk leaving the safety he’d found under the bed. The minutes ticked by and though he tried his best to hold it, he peed in his pajamas, soaking himself from the waist down. He started to shiver. It was quiet for a long time and then someone banged on the door and shouted something, but Elliott didn’t know if that was bad or good. He heard voices in the living room, not yelling, just talking, but he remained hidden. Mama would be home soon and she’d know what to do. Elliott decided to wait for her under the bed. More voices, drawing closer. The door to the bedroom opened. Elliott froze, wondering if it was the bad man coming to get him. He didn’t make a sound as a pair of legs wearing dark blue pants, with a stripe down the side, came into view. If he didn’t say a word or make any noise, maybe the person would leave. No one would have known he was there if he hadn’t coughed at that very moment. It was a bit dusty underneath the bed, and Elliott already felt a little wheezy, like he might need another dose of his medicine. The legs bent as someone crouched down to look under the bed and Elliott squeezed his eyes shut, terrified of what he might see. “It’s okay.” The man said, speaking softly. “I’m a policeman. I’m here to help. Can you come out from under there?” Heart pounding, Elliott didn’t answer. He couldn’t. More footsteps. More dark blue legs. Elliott stayed put. No one was yelling, but Elliott’s heart was still beating fast, and his body felt like Jell-O. A lady wearing a dark blue uniform lay down on the floor next to the bed. “What’s your name?” she asked. She sounded a little like his mama. Her smile was nice like Mama’s, too. He didn’t think a bad person would smile at him, so he answered her. “Ewiott,” he whispered. “My name is Officer Ochoa but you can call me Regina, okay?” He nodded. “How old are you, Elliott?” she asked. Using the hand not clutching the army man he held up three fingers. “Three, huh? That’s a good age. I want you to know that you’re safe and no one will hurt you. Can you come out from under there? Here, take my hand.” She stretched out her hand to him and he hesitated but finally touched her palm with his fingers. She urged him gently toward her. Once he was close enough she reached in and grabbed him by his pajama top, pulling him the rest of the way out. Elliott blinked and let his eyes adjust to the light. One of the officers noticed his wet pajamas, and his shivering, and they wrapped his Thomas the Tank Engine comforter around him, speaking in low, soothing tones. “I want Nana and Mama,” he said. They could barely hear him. “What is your mama’s name?” they asked. “Daisy,” he said. He knew this was true because it was the name other people called her when they said hello. And it was easy to remember because it was the name of a flower, and he liked flowers. He nodded. He and Mama had practiced saying it. “DiStefano,” Elliott said. Maybe it didn’t come out as clearly as it sounded to him because they repeated it back like a question and he nodded. The officers exchanged a glance and one of them said, “Got it.” The officer who spoke scribbled something on a pad of paper and left the room. He wanted his mama more than anything, so he said okay, and when she bent down and scooped him up, comforter and all, he put his arms around her neck. She hurried down the hallway and just before they got to the door, when he would have tried to look for Nana to make sure she was coming too, Officer Ochoa pulled Elliott’s head down to her chest and all he could see was the dark blue of her uniform. Tracey Garvis-Graves is the author of On the Island and Covet. She lives in a suburb of Des Moines, Iowa with her husband, two children, and hyper dog Chloe. She blogs at www.traceygarvisgraves.com using colorful language and a snarky sense of humor to write about pop culture, silly television shows, and her suburban neighborhood.